The Orbel Collection by Tech Lighting is inspired by Mid-Century modern art with contrasting geometric shapes. 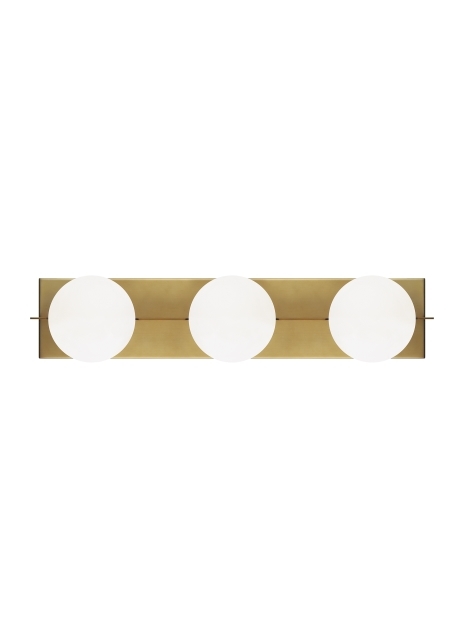 The Orbel bath light fixture features three stacked frosted spheres supported by a rectangular metal base. Generously sized at 24” long, the Orbel bath light is offered in three modern finishes, brass, matte black and polished nickel. Coordinate your design with other fixtures in the Orbel collection, the wall sconce, flush mount and low voltage pendants. Lamping options are compatible with most dimmers. Refer to the Dimming Chart for more information.